GYUMRI (ARMENPRESS)—An Armenian-French expedition has restarted excavation of the Yereruyk temple and nearby archeological sites, according to Armenpress. Yereruyk is the second largest three-nave basilica of Armenia’s early Christian age and has been at the center of interest of the Institute of Archaeology and Ethnography of the National Academy of Sciences of the Republic of Armenia and archaeologists from Aix-Marseille Universite of France for five years. Yereruyk is a three-nave basilica located in the Shirak region of Armenia, near Aniavan village, on the left bank of the Akhuryan River. The temple was built during the early Christian period of Armenia during the 4th or 5th centuries. 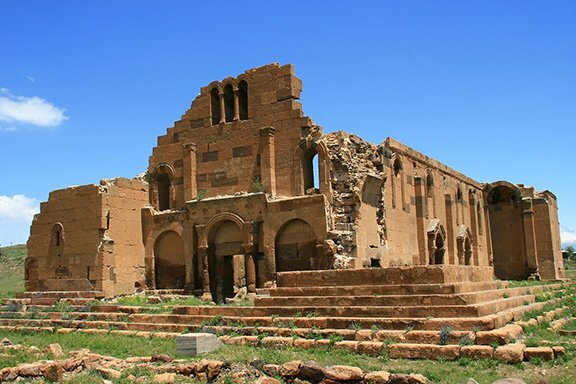 Though mostly in ruin today, it is considered to be one of the oldest and most valued Armenian churches of its kind. According to folklore, Yereruyk’s name derives from the architecture of the temple. From afar, it is said that the temple looks as if it is moving, due to the design of its columns. According to experts, it is one of the greatest Armenian temples of the early Christian age. Near the temple, a medieval reservoir 200 meters in length was discovered. Also near the temple site, archaeologists have discovered spacious underground rooms with exits and holes for lighting. Holes in the walls of the rooms are believed to have served as shelves and sitting area. In one of the rooms, scientists have found stones which are believed to be a table and two chairs, though their hypothesis cannot be confirmed. Yereruyk was built in dedication to Hovhannes Mkrtich—John the Baptist. The graves of children near the temple are believed to have been offered by John the Baptist for the burial of non-christened children. The complex functioned and continued to develop during the early Christian period of Armenia, prior to Arab conquests. It is believed that Yereruyk reached its peak in 10th-11th centuries around the time when the city of Ani prospered. This is what Armenia offered to the world. And the blood thirsty Turkey, the author of the word Genocide, offered nothing and nothing to humanity. Go ahead Obama and continue your blessing of this barbarian Turkey.